Two important announcements were made this week by Hockey Canada and specifically 2014 Olympic architect Steve Yzerman. They announced that Mike Babcock would be behind the bench again to lead Canada at the 2014 Olympics in Sochi, Russia, aided by assistants Ken Hitchcock, Lindy Ruff and Claude Julien. Babcock was the bench boss for gold in 2010 in Vancouver as were Hitchcock and Ruff as his assistants. Julien is the lone new member to the bench staff. Hockey Canada also announced it’s 47 player invite list for their summer evaluation camp. The camp will run from August 25-28 in Calgary, AB and will start the process of selecting the 23 player roster that will compete in Russia for Canada. The list includes 5 goaltenders, 17 defensemen and 25 forwards. 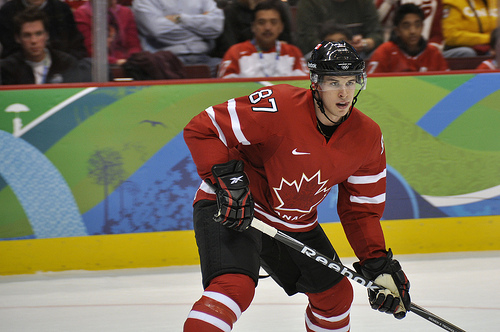 There are 15 returning members from the 2010 gold medal squad in Vancouver. There are nine forwards that will attend camp that were a member of the 2010 team. The list is headlined by Sidney Crosby and Jonathan Toews who were arguably the two best forwards at the tournament in Vancouver. They are joined by returnees Rick Nash, Ryan Getzlaf, Corey Perry, Eric Staal, Joe Thornton, Patrice Bergeron and Mike Richards. Other invitees include Martin St. Louis, Steven Stamkos, John Tavares, Jordan Eberle, Taylor Hall, Claude Giroux, Brad Marchand, Jeff Carter, Matt Duchene, Logan Couture, Chris Kunitz, Andrew Ladd, Milan Lucic, James Neal, Patrick Sharp and Jordan Staal. As with 2010 there is a wealth of forward talent and a mix of youth and veteran experience as well as plenty of versatility. It will be the position where the toughest decisions will be made and some all world talent will be left off. Some names will be locks, Sidney Crosby, Jonathan Toews, Eric Staal and Corey Perry to name a few as returnees. Newcomers like Claude Giroux and Steven Stamkos will likely also be pencilled in. The decision will have to be made as to how much youth Yzerman will want to take. There is a deep pool of talented Canadian youngsters to choose from like John Tavares, Taylor Hall, Jordan Eberle, Matt Duchene and Logan Couture. All of which have represented Canada at one level or another, but nothing on this stage. Notable names left off include past Olympians Jarome Iginla and Patrick Marleau, young stars Jamie Benn and Evander Kane as well as Senators forward Jason Spezza. 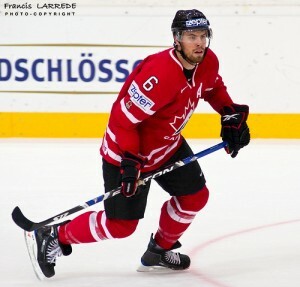 Three of Canada’s top four defensemen from Vancouver also return as Duncan Keith, Drew Doughty and Shea Weber will again be attending camp. Also invited were fellow returnees Brent Seabrook and Dan Boyle. Those five will be joined by Norris Trophy winner PK Subban, Kris Letang, Karl Alzner, Jay Bouwmeester, Alex Pietrangelo, Mike Green, Dan Hamhuis, Travis Hamonic, Mark Methot, Dion Phaneuf, Marc Staal and Marc-Edouard Vlasic. The decisions will be tough on the blue line, but less so than with the forwards. Keith, Seabrook, Doughty and Weber will likely have spots again and Kris Letang would be extremely tough to leave off. With just a few spots left that will be the tough call, and one would have to think PK Subban and Alex Pietrangelo have put themselves in a spot to get an extra look for two of them. Names left off the list for camp include shutdown defender Dan Girardi and second year defenseman Justin Schultz who would have been a long shot but was thought to have at least gotten an invite. Only one of the three goaltenders from Vancouver are invited to camp in 2013 and it’s the man who was between the pipes in the gold medal game. New/old Canucks starter Roberto Luongo is one of five goaltenders invited to camp. Habs goaltender Carey Price was also invited and appears to be one of the favourites to grab a spot for 2014. Also invited was Corey Crawford, Mike Smith and Braden Holtby. Luongo and Price look to be the early frontrunners for two spots, with Crawford and Smith having a leg up on Holtby in the battle for the third roster spot. There were some notable omissions at this position as well with 2010 members Martin Brodeur and Marc-Andre Fleury getting snubbed as well as Carolina netminder Cam Ward. 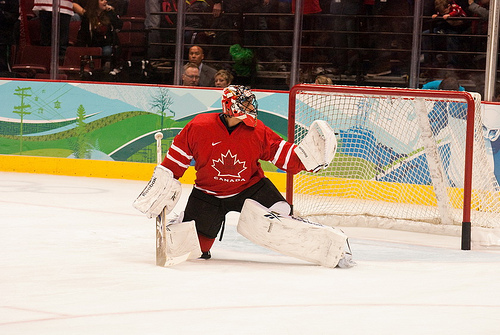 Roberto Luongo played solidly for Team Canada as it won gold in Vancouver.